Hey guys quick question. I just acquired a tiger bark ficus and i heard they grow pretty easily indoors. I was just wondering if this plant could go in my office at work. Very little light gets to my cubicle but it would be nice to have some plantlife around me. Would he just suffer in this low light condition? I keep several Ficus indoors over the winter under just such lights and they do OK. They don't grow gangbusters but they remain healthy enough to get through he winter. I really prefer to have them outside when the weather permits and that is when I get the bulk of my growth for the year. One more thing people forget to provide. Ficus, being a jungle plant from the tropics, just loves very hight humidity. Home and office environments are are dry as a desert, especially with a/c. No day to night variation of temperatures. No morning dew. No rain to wash the leaves. In short. It can live (limp along or thrive) in your office space but give it a fair chance by providing as much of the above as you can with daily misting - morning and afternoon if you can. Keep a sprayer handy. If you don't work weekends be extra generous on Fri & Mon. Holidays and vacations must also be considered. Bonsai, even ficus, actually need DAILY care. How big is this tree? How much are you willing to invest in keeping it in your office? For about $50, you can go with an Exo Terra 8"x8"x12" "nano" terrarium with a 26W CF light hood. 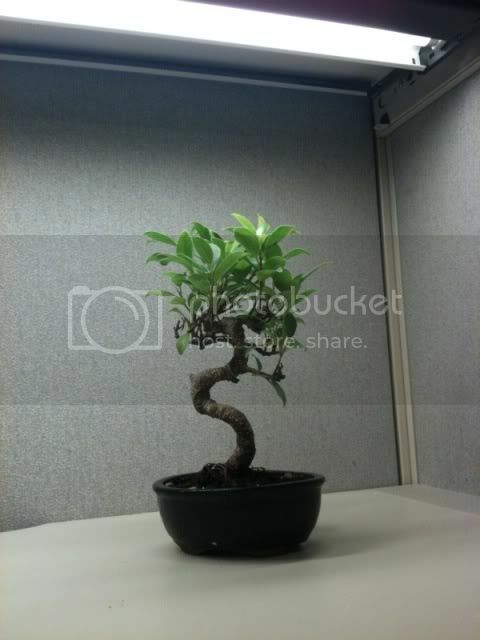 This should keep the tree VERY happy and growing in a cubicle. I currently keep Carnivorous Plants this way and have seen nice growth, flowering, etc. If you use the bottom of the terrarium as a humidity tray, you should have no problem keeping the humidity over 50%. The light will raise the temp around 5-10Ã‚ÂºF during the day as well. Just put it on a standard appliance timer to take care of the weekends. 12-14 hours of light is fine. When does ficus microcarpa bark lighten up? ficus approach grafting - need to shave bark?